Getting Rid of "That Smell"
Whatever is growing in your basement or crawl space could be stinking up your house. How your home is at risk for flooding due to spring showers and rising water tables. Egress windows can make your basement brighter and more comfortable! What's waiting at your lake house? 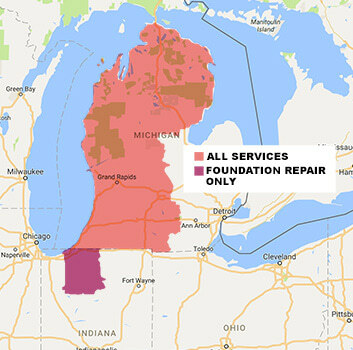 Michigan is full of quirks - get an inspection from someone who knows them. Regular maintenance visits are the key to keeping your crawl space protected. Try to contain your excitement. Let's talk about how to make it easier. Piering - It's Not Just for Houses! Piers can be used to stabilize and lift more than just your house. Extend the life of your driveway and minimize your maintenance. A few small projects can save you a lot of time this summer. There are a few waterproofing tasks you can DIY - but none of them involve that rubber paint. If your crawl space is dirty, so is the air you're breathing. It's (Supposedly) an Early Spring...Now What? Knowing what lies ahead can help make you better prepared. Whether you're buying, selling, or staying, there's always room for improvement. Taking a few simple steps can prepare you for our mini winter warm-up. Installing a whole-home generator means the end of worrying.